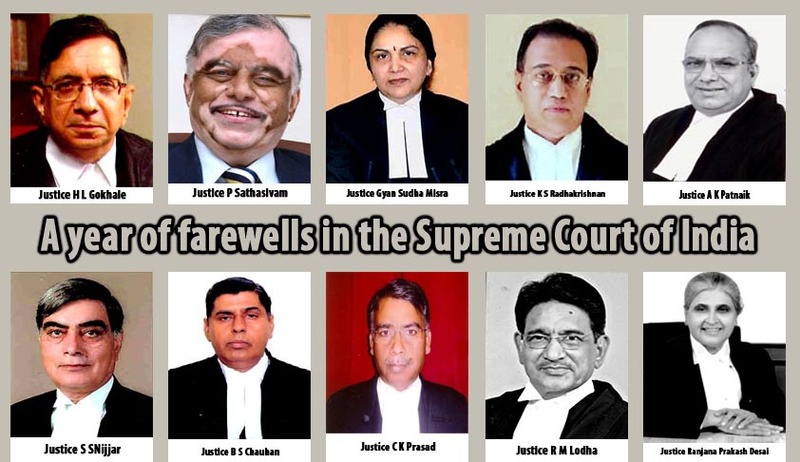 The Supreme Court of India is set to experience a landmark change in the coming 12 months with regard to the court’s structure as out of the 15 senior-most judges, 11 will retire, including Chief Justice of India P Sathasivam and his successor R M Lodha. The year 2013 bid goodbye to Justice G S Singhvi who retired on December 11. Justice Singhvi headed the bench which was investigating the CBI probe into the 2G-spectrum scam. The first ten months will witness the retirement of one-third of the Supreme Court Judges. With 11 eminent judges retiring in a year, almost half the judges would have less than one-year experience in the highest court. The first one to superannuate on March 9 would be Justice H L Gokhale. The retirement chapter for this year, which begins from March 9, will end on October 29, with the superannuation of Justice Ranjana P Desai. Chief Justice of India Justice P Sathasivam who retires on April 26, before bidding goodbye to the apex court will pronounce judgment on over a dozen petitions filed by convicted prisoners who have challenged President's decision to reject their mercy pleas on the ground that the long delay in deciding their mercy pleas has vitiated the process and sought commutation of their death penalty to life imprisonment. The decision on the validity of the Wage Board which will be decided by a Supreme Court bench headed by Chief Justice of India P Sathasivam, will also be a much awaited event for the country. The bench is in the final stages of completing hearing on the petitions challenging the award given by Justice G R Majithia headed wage board. The final say on examining the CBI investigations into alleged irregular allotment of coal blocks will be pronounced by a Supreme Court bench headed by Justice Lodha, who would become Chief Justice of India on April 26 and retire on September 27. Succeeding Justice Lodha as Chief Justice of India on September 27 would be Justice H L Dattu who will be part of a Supreme Court bench comprising Justice K S Radhakrishnan, whichis expected to bring an end to the four year old examination of the CBI investigations into 2G spectrum scam, which was initiated by a bench of Justices G S Singhvi and A K Ganguly. A petition which questions the Centre's decision to link Aadhar cards to availing of benefits under social welfare schemes, will be dealt by a Supreme Court bench headed by Justice Chauhan, who would retire on July 1. It has already been clarified by the Supreme Courtthatjust because a person does not have an Aadhar card, the Centre should not denyperson the proposed benefits andhas also asked the government to make sure that no illegal migrants are allotted these cards. This year the Supreme Court of India will also bid farewell to its two women Judges, JusticeGyanSudhaMisra and Justice Desai. An important fact to be noted here is that there have been only three women Judges in the history of apex court, prior to Justices Misra and Desai, and it can be said that it would be a tedioustask for the current Chief Justice of India Sathasivamas well as for his successors, Justices Lodha and Dattu, to appoint women judges to the apex court. This is so because unless the collegium headed by the Chief Justice of India recommends appointment of a woman judge before they retire, the court will have no female representation. With an approved strength of 31 judges including the Chief Justice of India, the Supreme Court is functioning with 28 judges and considering the large number of retirements this year, it will be a huge responsibility on the collegium headed by Chief Justice of India P Sathasivam, which comprises Justices Singhvi, Lodha, Dattu and Chauhan to quickly fill the vacancies by recommending names much before the posts fall vacant. Keeping in mind the Supreme Court’s pendency rate, which is on a gradual rise, and very soon can go up to 70,000, it is critical for the Chief Justice of Indiato consult his colleagues toformulateavital mechanism for immediate disposal of cases. This in turn would require instant filling of vacancies as well, in the Supreme Court of India.